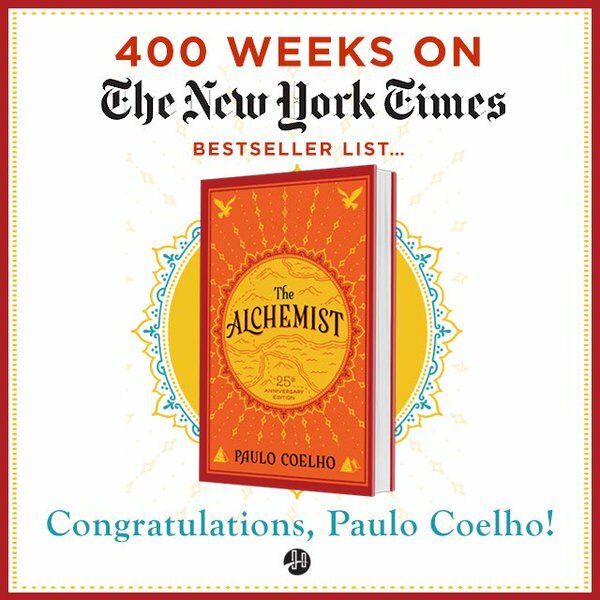 Congratulations Paulo Coelho, Sunday The Alchemist four hundred continuous weeks in New York Times best-seller list. What a way to end April 2016. Not bad for a book that was first published twenty seven years ago. Good books spread by word of mouth. Only rubbish needs marketing hype. 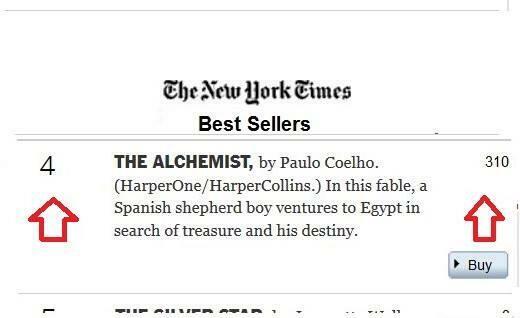 Congratulations Paulo Coelho, today The Alchemist three hundred and sixty-nine continuous weeks in New York Times best-seller list. That is an amazing seven years and one month and one week. And it is at No 3. Not bad for a book that was first published over twenty six years ago. Many have probably already forgotten the Islamists who walked into the Charlie Hebdo office and slaughtered innocent people. Not English PEN. To mark the event and to commemorate World Press Freedom Day they have a published Draw The Line Here, a collection of cartoons drawn in response to the Charlie Hebdo attacks in Paris in January 2015. 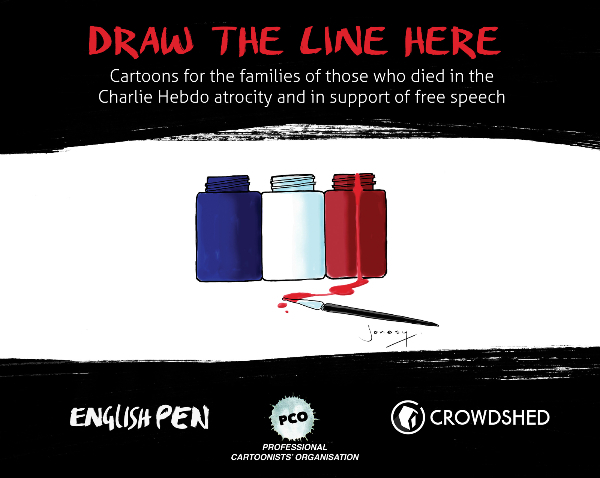 Draw The Line Here is a collaboration between the Professional Cartoonists’ Organisation (PCO), Crowdshed, and English PEN. It features cartoons drawn by British artists in the days immediately after the attacks. The work of 66 cartoonists is featured, including Steve Bell, Dave Brown, Martin Rowson, Peter Brooke and Ralph Steadman. Proceeds from the book will be split equally between the fund for the victims of the Charlie Hebdo murders, and English PEN’s Writers at Risk programme. Publication of Draw The Line Here was made possible by a crowd-funding campaign launched in February. Over 200 people pledged their support to the project, and will be receiving their copies of the book in the coming days. It would be an excellent idea if Draw The Line Here was also available as an e-book, if on leanpub, pay what you like. Some cartoons here are gentle, others savage; some merely encapsulate the bafflement and sadness of a world where mockery is met not with the proper response, a shrug, but with murder. Again and again the theme is of the fragility of the sceptical, laughing pencil: its simplicity and its splendour, the opposite of the vainglorious, meaningless squalor of the gun and the bomb. We are extremely grateful to the PCO and to Crowdshed for choosing English PEN as a beneficiary of this project, and of course to all the cartoonists who have contributed to the book. By exercising their own right to freedom of expression, these artists are helping to defend the free speech of others. The publication of this book could not be more timely. Sunday 3 May is World Press Freedom Day, the perfect time to stand in solidarity with Charlie Hebdo. Being a writer, a journalist, a blogger is a very dangerous occupation these days. Raif Badawi was sentenced to weekly floggings for writing a blog. To mark World Press Freedom Day on 3 May, English PEN has joined more than 50 free speech organisations and media groups in calling on governments to uphold their international obligations to protect freedom of expression. On World Press Freedom Day, 116 days after the attack at the office of the satirical newspaper Charlie Hebdo that left 11 dead and 12 wounded, we, the undersigned, reaffirm our commitment to defending the right to freedom of expression, even when that right is being used to express views that we and others may find difficult, or even offensive. We go round in circles. 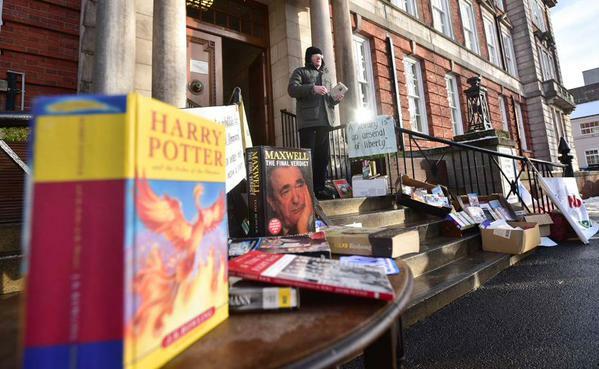 Lincolnshire County Council decided upon mass closure of public libraries. There was no public support, but hey, we are arrogant county councillors, our only interest is in getting our snouts in the trough. We don’ t give a toss what the public thinks or wants. The Council were challenged in the High Court. Lawyer acting for the Council was forced to admit, not a single person in favour of library closures. The judge slammed the council for its arrogant high handed treatment of local people. A victory for the local people. The Council could then have done the decent thing, heeded public opinion, listened to what the judge had to say. But oh no, mass closure of public libraries was back on the agenda. At a scrutiny committee last week, its role as the name suggests, to scrutinise. The public were allowed to speak, but only for three minutes. A councillor who tried to raise valid points, was cut off mid-stream, all discussion or debate terminated. The committee rubber-stamped mass closure as they had been ordered to do. This is what constitutes scrutiny in Lincolnshire. Today the executive voted on the matter. The same executive who had decided on mass closure of public libraries. It was a foregone conclusion, mass closure of public libraries. County councillors who show arrogant contempt for the public. County councillors who think they are above the law. County councillors who are unfit to hold public office. County councillors who should be surcharged for so far wasting nearly three-quarters of a million pounds of public money. The decision to close libraries has no support, not from local people, not from writers, not from local councils, not from county MPs, not from government ministers. The Philistines that took the decision to close libraries are completely isolated. They represent no one other than themselves. This is what constitutes democracy in Lincolnshire. Out of 45 libraries, only 15 will remain, leaving 30 that will either close or be run by volunteers. Volunteers are making very clear, they are not prepared to be unpaid labour for a corrupt and rotten council. The 30 will suffer a slow death. Of the 15 on reduced hours, the Council is trying to privatise. The public do not want to see their libraries closed. Two fingers to the public. And what do the library staff think? The library staff are gagged. Consultation is not going through the motions. Consultation is heeding what is said, then adapting policy accordingly. The Council has a legal duty to carry out genuine consultation. In this the Council has failed. As we have seen in Greece a Syriza grass roots revolution is required in Lincolnshire, not because local people want the trappings of power or wish to get their snouts stuck in the trough, but because much needed reform is required in the way the County Council functions, currently Lincolnshire County Council is not fit for purpose. did WHSmith Lincoln have Paulo Coelho’s lastest book in stock? Not known, as no could be bothered to unpack the delivery. Maybe they would know later in the morning, say around midday. Er no, as no one would have unpacked the delivery. The delivery would not be unpacked until the following day. Later in the day, it was learnt WHSmith Lincoln had copies of Adultery, how many copies not known. It is unbelievable anyone can conduct business in this slapdash manner and still remain in business. Adultery, published last week, an international best-seller from an international best selling author, WHSmith has it on special offer at half price, only they do not know if in stock because no one can be arsed to unpack a delivery, let alone not as one would expect have on prominent display! If you have an international best-seller on special offer, do you not have it in stock on prominent display? It is little wonder WHSmith a failing High Street chain, permanent fire sales. The only surprise is that they remain in business. Would Waterstone’s Farnham have Adultery, latest book from Paulo Coelho? I did not have to ask, three copies on display by the door with new books. At least Waterstone’s Farnham on the ball, which is more than can be said for Waterstone’s Guildford or Waterstone’s Godalming. Heavy showers all day, as a result, only made WHSmith Aldershot a little before they closed. Twelve minutes to be exact, but would have thought already closed as shutters down, lights turned off. How to make customer welcome. Layout appears random, I asked did they have Paulo Coelho’s latest book, which was published today? Although the one and only girl, there appeared to be no one else in the store, tried to be helpful, she had not a clue what I was asking for, and I had to spell several times. She looked it up, no. I expressed surprise, said it was published today. She said try next day, when they had a delivery. Delivery day was Thursday, ie today, and this had been confirmed two days ago, otherwise I would not have made the trip to Aldershot. Yes, delivery was today, but no one could be bothered to unpack the delivery. It is little surprise WHSmith is a failing High Street chain, with permanent fire sales as the only way to stay in businesses. The only surprise is that they are still in business. It is easy to see why people buy from Amazon, it is not only that cheaper, in this case near enough half price, it is that you get prompt service. Had I placed an advance order, I would have had delivery today. Adultery published today, is an international best seller, from an international best selling author. Adultery has shot to Number One in most if not all countries on release. Paulo Coelho has a new book, Adultery, out mid-August. Would the experience in Lincoln be any better than previous releases? No, not aware of release, looked up on computer. Due out Thursday, one copy. This is a large bookshop, an international best-seller from an international best-selling author, the staff not aware, and one copy. It is a reasonable expectation, that staff working in a book shop, have some knowledge of imminent releases from well known authors. At the very least would expect the store to supply briefing sheets to their staff. One copy sold and they will have sold out. On Sunday, Paulo Coelho with The Alchemist, three-hundred and fifteen continuous weeks, that is six years, in the New York Times best-seller list. Adultery has in most if not all countries, leapt to No 1 on publication. Note: There are two large Waterstone’s in Lincoln. The one checked was the one in the market, former Corn Exchange. 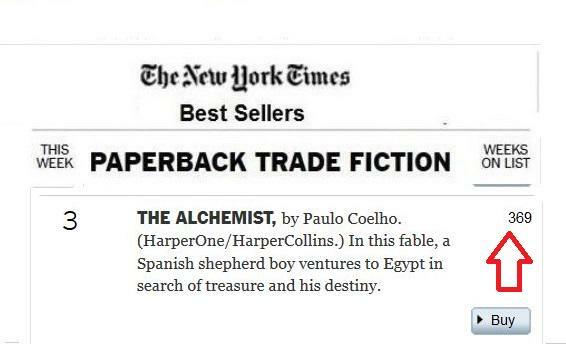 Congratulations Paulo Coelho, today The Alchemist three hundred and fftteen continuous weeks in New York Times best-seller list. That is an amazing six years. And it is at No 5. A few weeks ago, it was at No 3. Not bad for a book that was first published twenty six years ago. 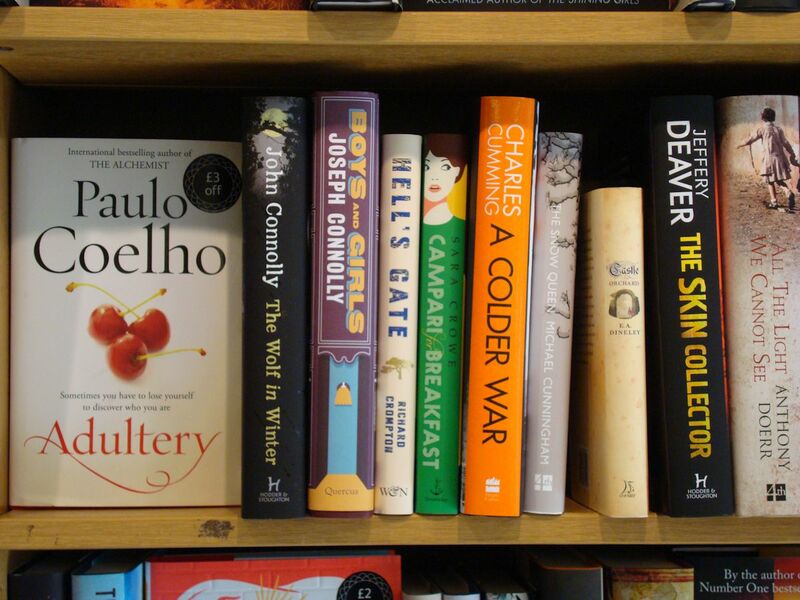 Paulo Coelho has a new book Adultery out in England middle of this week. Ask in Waterstone’s and they do not have a clue what you are asking for. And how many copies on order, even in a large bookshop as in Guildford, the former Ottaker’s flagship store (and far better run when it was)? Er, one! RT @christ_essis: : La vie est belle, #CarpeDiem "@paulocoelho: profitez de la vie! 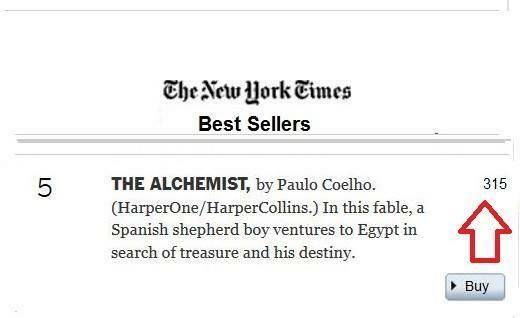 pic.twitter.com/RMqkPdOyp4"
Congratulations Paulo Coelho, today The Alchemist three hundred and ten continuous weeks in New York Times best-seller list. And it is at No 4.